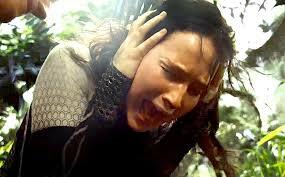 Catching Fire picks up a few months after the Hunger Games left off. Katniss and Peeta have arrived home to District 12 and now live in elegant digs compared to what they had before taking part in the Hunger Games. Peeta’s sulky because the romance he dreams of with Katniss has not taken place offscreen, and Katniss is suffering from Post-traumatic Stress Syndrome. 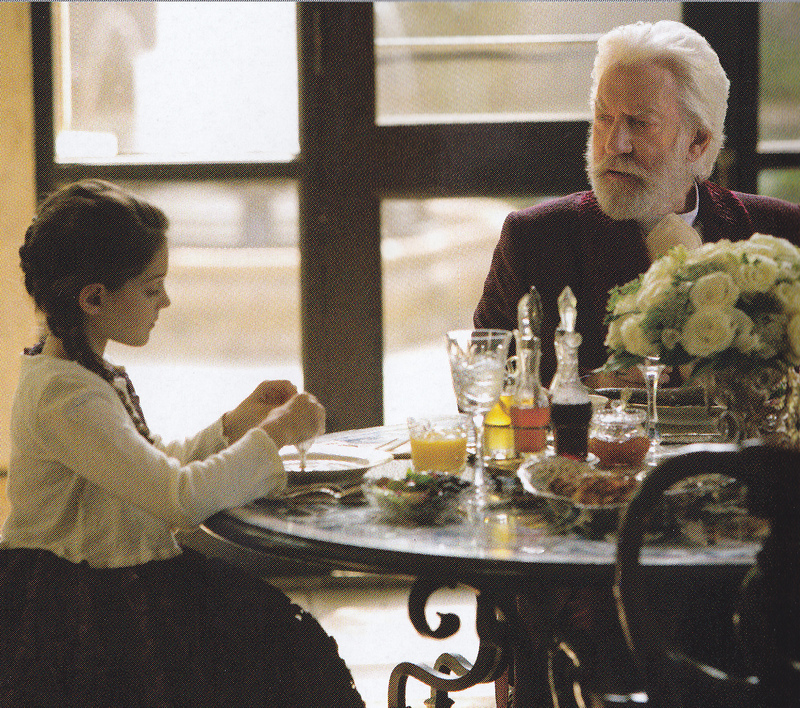 President Snow, the creepy and elegant Donald Sutherland, visits Katniss right before her Victory Tour, telling her she has to sell this romance and make it believable. 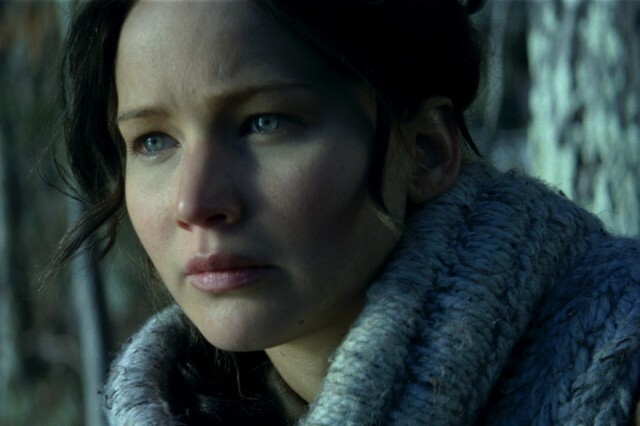 Signs of dissent have spread throughout the Capitol and surrounding districts, and Snow is even seeing the results in his own household, when his granddaughter (Erica Bierman) appears at the breakfast table in Katniss’s trademark braids, telling him, “All the girls wear their hair like this.” This girl from District 12 has become a symbol of something he doesn’t want, but everybody else likes, even loves, her. For going against the rules and inspiring others to question their drudge of a life, Katniss must be punished. And Jennifer Lawrence’s acting is a gem here, as she pretends to be a bad actress while on the Victory Tour, all hammy, SNL skit-like with eyelash batting and fake smiles, alongside Peeta (Josh Hutcherson). President Snow is not pleased with the results, and with Plutarch Heavensbee (Philip Seymour Hoffman), he decides she must be eliminated. The Quarter Quell is upon them, a special edition of the Hunger Games that comes about every twenty-five years, and the twist this year is to reap past Hunger Game winners from each district and make them repeat the games with the best of the best. I found this installment of the movie much more emotional than the first, now that the main characters have been established and people have gotten over their Fatniss fixation. There were so many times I felt my heart in my throat, especially in the scenes with Katniss and Peeta showing real love for each other, in contrast to what they faked during the Victory Tour. Though Katniss doesn’t have the love connection with Peeta that she does with Gale (Liam Hemsworth), he is the only person who understands what happened to her during the Hunger Games. And he loves her desperately, though she doesn’t understand why. There are very few changes between the book Catching Fire and the movie, and most are those of omission. Peeta tries to save Katniss from entering the arena again by dropping a baby bomb, which isn’t described as such in the novel but the term is adopted in the movie, and I like how parallels are drawn between our celebrity-driven culture and these bloody games. A baby bump becomes a complete game changer, and while Katniss cannot avoid the Quarter Quell, she’s able to manipulate the sympathies of viewers and possible sponsors. The omissions, I think, help heighten the tension, so viewers aren’t bored and easily able to figure out what’s going to happen in the end. And maybe that’s good for those who have read the trilogy as background before going in to the movie, but I watched it with two who had not read the books, and they both felt like they were missing important information. Then I watched Catching Fire again with my nine-year-old niece when I was visiting for Christmas, and she needed information to process what was going on on-screen. I answered her questions in whispers, trying not to piss off the people in back of us, and when she got it, her face lit up with pure pleasure, enjoying the story of tough ladies and guys trying to make it out alive. Afterward, she wanted to play Hunger Games, using characters from the movie Catching Fire. She didn’t want to be Katniss, who she deemed too nice. Instead, she invented her own character Catty, who had Katniss-like traits with a little bit of Johanna mean. Johanna’s mean streak intrigued her (a standout performance by Jena Malone), but my niece didn’t feel like she could act out those parts so I was assigned her character. It made me happy that instead of one girl part, my niece had several female roles to choose from—a healer, a genius, a warrior, etc.—to see what fit her personality. Our playacting brought to mind one of the press junkets the Hunger Games cast did for the first movie. One of the questions given was which character would the other actors liked to have been, and Jennifer Lawrence mentioned how nobody ever chooses Katniss. I think it’s because we already envision ourselves as a Katniss, a hero who is brave and loyal, but we would like to try on brutishness or vulnerability, traits that aren’t usually interpreted as heroic. I’m glad someone else liked this. I get so much flack for liking this series, which I don’t get at all. Really? Everybody’s such big fans in my family. Even my dad bragged about reading the Hunger Games trilogy in a week.